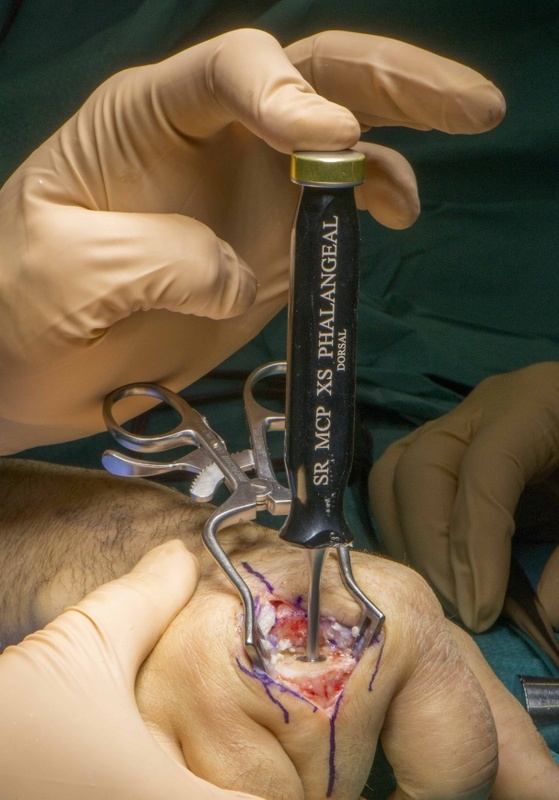 Learn the Stryker SR MCPJ Cemented Joint replacement surgical technique with step by step instructions on OrthOracle. Our e-learning platform contains high resolution images and a certified CME of the Stryker SR MCPJ Cemented Joint replacement surgical procedure. This is a detailed step by step instruction through a Middle finger Metacarpo-phalangeal joint (MCPJ) cemented joint replacement with the Styker SR MCP joint implant via a dorsal midline approach. This is a procedure usually performed for osteoarthritis of the MCPJ with stable collateral ligaments. It can also be performed for post-traumatic or well controlled inflammatory arthritis as long as the bone stock and soft tissue stability can support the joint. The procedure can be performed as a day case under regional or general anaesthetic and take around 1 hour. Following a period of 1 week in plaster cast the patient then starts mobilisation with a Bedford finger splint and are provided with a night resting splint at 30 degrees MCPJ flexion. The patient should achieve their pre-operative range of movement with minimal pain by 6 weeks and at this point should start strengthening exercises. The joint will always appear slightly swollen however the majority of post operative swelling will resolve by 3 months. Institution: The Royal Orthopaedic Hospital, Birmingham ,UK.